Polline made her debut for the Team at the 2013 Bath Half Marathon, her first race outside of her native Kenya. Running in wintery conditions with snow and strong winds it was a fantastic performance, setting a personal best time of 1:10:28 and heading off strong competition. Continuing her winning streak through to the autumn race season Polline ran a fierce race to take 1st position at the Krems Wachau Half Marathon in Austria. She followed this up with a stellar performance at the Swansea Bay 10k with yet another 1st place, 97 seconds ahead of the second finisher and setting a new course record. After closing her race season with another victory at the Ikano Robin Hood Half Marathon, Polline boarded a flight to Kenya to resume training. No sooner had the plane touched the ground when Polline received an invitation to race at the prestigious Great Scottish Run three days later. Polline returned to the UK and lined up shoulder to shoulder with Haile Gebrselassie, putting in an impressive run and taking 3rd place, despite a tiring travel schedule. Less than two months later Polline competed in another of the Great Run events, this time the Great South Run. Despite the final two miles of the race being run into 35mph headwinds, Polline came in a strong 2nd place behind World Champion Florence Kiplagat. In her penultimate race of 2013, the Tan Tan 10k in Morocco, Polline took 2nd place in 31:22; not only setting a new personal best at this distances but also securing a place in the top 10 world rankings for 2013. 2014 was to bring even more success for Polline, beginning at the 2014 Warsaw Half Marathon where she achieved a trio of successes; personal best time, course record and a sub-70 finish time of 1:09:06. 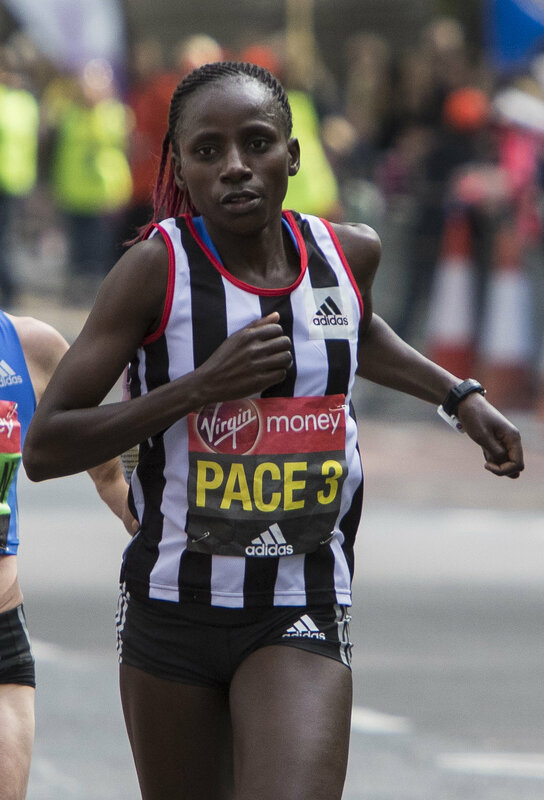 In April Polline was invited to pace the second group of elite women at the London Marathon, where her quick thinking and positive action drew many compliments in the media. It became clear early on in the race that the first group were struggling to keep up with the lead pacers and had lost around 60 meters. Polline, who was sharing responsibility for group two with a Run-Fast team-mate, accelerated to join the first group and encouraged them back to the prescribed pace before dropping back and continuing her own pace duties to the halfway mark. In October 2014 Polline made her ultimate mark on the UK road racing scene with a win at the Great Birmingham Run. Polline dominated the women’s race from the gun and held her own on what is a challenging course at the best of times. In spite of the hills, windy conditions and a painful stitch from mile 12, Polline showed grit and determination to take first place in 1:10:48. Having now graduated from the development team, Polline is gaining invaluable experience on the international racing circuit. If she continues her steady progression she will confirm her position as one of the world’s most promising road running talents.